‘baber’ instead ‘paper’ and so on. These mistakes occur because of the consonant contrasts between certain consonants that are very similar in pronunciation, hence people the sound that’s easier or more familiar to them. For example I had a young student in China (8 years old), who couldn’t pronounce the sounds /g/ and /c/ - he would say /d/ and /t/ respectively. So he wouldn’t say ‘cat’ – he would say /tat/, etc. and he would do this with Chinese words as well, not just in English. When I pointed this out to his mum, at the end of our first lesson, she said casually “Oh, yeah…”, nodding her head, as if to confirm that she knew about this speech defect in her child. I was amazed! Did they not care to repair this pronunciation flaw? They explained to me that they couldn’t, with the help of an interpreter. You couldn’t imagine the child’s enthusiasm when, by the end of his third lesson with me, he was proudly showing me how we pronounce /c/ and /g/ from the throat and he was doing it correctly as well. Poor kid, only needed to be made aware of this and shown the right way of uttering the sounds! OK, this being said, let’s look at the sounds that are frequently mistaken in our speech, depending on the influence of your first language and flaws you bring with yourself to start with. Because my present students need a quick course in writing and speaking, before their next exam in two weeks’ time, I shall focus our attention on this matter, but this will help anybody who wants to improve their communication skills – be they in writing or in speaking. (3) What order to put them in. While we are at school, it is the teacher or the textbooks that dictate the subject or the propositional content you need to speak/write about. However, in real life it is YOU who decides what you want your writing to do, or what you want to say. That is the first one from the above list of three choices we make any time we speak or write. As for point (3) - how you put those words together is another crucial choice, called the syntax or SYNTAGMATIC choices. At a later stage, we shall look at what exactly goes into a sentence in more detail. For now, let's just get the idea of it. A -> Concepts = the words, phrases or clauses we use in communicating. We can refer to objects, people, places, direction and distance, conditions, duration, frequency – anything that crosses our minds! In fact, this category is only limited by our imagination. 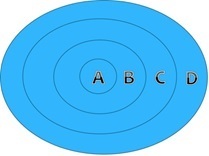 B -> Information, reality and belief = the sentence - here we distinguish between statements, questions and responses. We can have yes/no questions, open questions (what, who, where, when, why), questions about alternatives, questions with positive or negative bias; responses to statements; requests for repetition, etc. In fact, this category is also sufficiently large to explore along many months of pleasurable studying. C -> Mood, emotion and attitude = utterance. We need to consider this aspect, because language is more than giving and receiving information. It is communication between people. It often expresses the emotions and attitudes of the speaker, who often uses it (the communication) to influence the attitudes and behaviour of the listener/reader. D -> Meanings in connected discourse = discourse or text. We cannot consider communication in isolation. We communicate so that we put meanings together and present ideas. We make transitions between ideas, we change the subject of our communication, we add or subtract ideas, depending on the listener/reader's reactions, we reinforce our ideas, by using others that sustain them, we explain, summarize, generalize, reformulate, etc. Going back to our discussion on CONTENT and STYLE, we can use a metaphor like 'Style is the dress of thought'. You have a naked body (content) and you dress it one way or another, in order to best present it in the context and to the audience it is meant for. Starting from next time, we shall look into how we deal with point D – the communication of ideas, the transitions we create between them and how we do this practically by combining our words correctly and appropriately, according to the information we need to convey and the mood or emotion we want to expose to our reader or listener. So, how does the Filter tool work exactly? When you click on the Filter button, the filter boxes and the corresponding column of numbers appear just below the column labels. If you enter 1000 into the Value Demand filter field when the default filter is "greater than", this automatically delivers all keywords that have Demand greater than 1,000. All the words meeting this criterion will appear immediately. In total we have 152 words in this Keyword List (KWL), but if you type each Seed Word into the filter field in that column. Use "contains" (the default) to find the words that contain each Seed. "Caribbean" has 126, "anguilla" has 6, and "antigua" has 20. For each potential Site Concept, you now see the potential strength and depth. In other words, you know how many keywords there are with Demand greater than 1,000 for each potential Site Concept Keyword. This is a common pattern. The higher the Supply (in Action #1, if you remember from our last lesson), the more keywords you'll find with higher Demand, here in Action #2. Your job is to find a Site Concept Keyword with a Supply range that is winnable and with a reasonable number of words with good Demand (greater than 1,000). 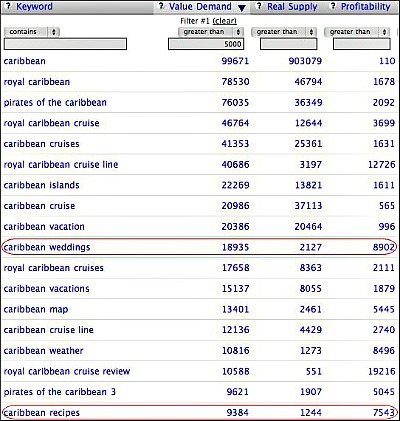 This is how we find ‘Caribbean weddings’ - Wow, great potential: good Demand, low Supply, and the same goes for ‘Caribbean recipes’! By now, you can start to see the power and flexibility of this approach. You not only can rule out niches that are too narrow, you can find new sub-niches in niches that interest you, but are too broad to consider entirely. 1. We sorted by Real Supply to do a quick check of the winnability of our 3 potential Site Concepts. "Caribbean" worried us, but we found a couple of other potential winners. 2. Next, we filtered by Value Demand (greater than 1,000) to get a quick idea of the depth (number of keywords with high Demand) and the intensity (how high) of the Demand for each of the 3 Site Concepts. Next time we'll start looking into Phase 2 of the stage of finding the best Site Concept. Although this looks quite technical, it is probably the most important stage in designing your website. Without choosing the best website subject for you, you are going to be doomed to build a website you won't particularly enjoy, or EVEN WORSE, you'll abandon your efforts after a short while, thus wasting your time anf effort for nothing.